The Yorkville YSM5 is the most compact studio monitor in the YSM series, making it perfect for small listening spaces and desktop studios. Unmatched clarity, precise reproduction and surprisingly punchy bottom end response for a monitor in this class, the YSM5 uses a solid -inch MDF cabinet and baffle to reduce rumble and cabinet self-interference. The front facing port design solves the issue of bass coupling with back walls and corners in small environments which can generate false low-frequency information in your mix. Compatible with virtually any source, Yorkville YSM5 has a widely variable input trim control making it compatible with any source including direct connection to a soundcard, or connection to a professional console control room output. Four position high frequency trim control that allows user to adjust EQ to compensate for speaker placement in less than perfect listening spaces. Contoured MDF baffles, custom designed soft dome tweeters and high quality low frequency woofers used in Yorkville's YSM Series monitors combine to minimize front face reflections creating improving phase response, providing a wider 'sweet spot' in the listening position. Front facing port design solves the issue of bass coupling with back walls and corners in small environments which can generate false low-frequency information in your mix. Compatible with virtually any source, Yorkville YSM Series Studio Monitors have a widely variable input trim control for the balanced XLR / 1/4-inch combi-jack input. Rock-solid 3/4-inch MDF cabinet construction with heavy internal bracing and ample internal dampening material reduces unwanted low frequency rumble ensures Yorkville YSM Series cabinets reproduce source material with near pinpoint accuracy and detail. The treble and mids are clear, the bass is solid. If I had a choice between rokit 6 or these i will definitely get these! I bought these around four years ago. I listened in-store to Rokits etc and was underwhelmed to be honest and I thought I could detect a bit of coloring here and there. Anyway, I came away with the YSM5s and I have never been disappointed! I've certainly put these hardworking monitors through their paces - they're switched on and working full time - all day every day from morning to night (for 4 years!) and they've never let me down! Don't be fooled by the price tag, they're definitely good enough to help you accurately deliver great sounding work! You don't need to shell out top dollar! These days, it can be a challenge balancing professional with a budget but these monitors are flat, have wonderful clarity (without ear fatigue) and I feel they can be trusted to deliver an honest representation of what I'm doing! Definitely the best quality bang-for-the-buck! Sound awesome! Great price for great sound. Thanks Gerry from the Kingston Ontario store. Always great to deal with, and knowledgeable! I'm amazed at the bass from these little guys, don't be fooled by their size! I'm impressed with these. Like alot of other reviewers, I was thinking about the krks, but looking for an alternative as I found them overly middy, 'boxy'. Made me wonder why the krk's were so popular. Not much else in the same price range....Lo and behold, I did some reading about these yorkville 5" and as per my usual frugality, I hmmmed and hawwed and finally decided to dish out $400 with the thought : hey, at least I can always send em back if they don't work out! When they arrived, I hooked em up, listened through most of my recordings through them, and fell in love. These are exactly what I wanted; transparent, clear, and just just plain good. They really showed me the strengths and imperfections of my mixes, I can't stress enough how my mixes have improved since getting these! Great for listening through as well as reference/mixing! Great purchase. While im enjoying the quality of tone im getting out of these things im truly astounded listening to some of my music collection on them. literally hearing things ive never heard before.. Support and help from the audio dept at victoria location Has been spot on bar none. i continue to be a very happy customer at L&C victoria. I really love the sound of these and had my eye on them for a long time, and for the price I liked them much more than the rokkit 5's. I did demo them in the store but never doubke checked the features with my own eyes and the one thing that kinda made me upset was that on every review( even on the LandM page they claim to have high and low knobs and when I got them home I realized they only have a high adjust! I then found out only the higher up models have the low knobs! it was one of the reasons I thought it was a great deal for the money and dont know why every product review I read on these they claim the high And low knob! did they used to have them? anyway for the price I still think they sound great. just realize if your wanting a low db know that they dont have one! great sound though! very true, the highs are very clear and crisp and the mids and lows are not muddy at all! very flat and true speaker! perfect for a little basement like mine! worth the money, and down the road you could add a pair of 8 inch monitors or a sub for a great setup! also these are just great for pumpin tunes!!! These studio monitors sound great! The power On/Off switch on the front is a great feature. Designed by Yorkville Sound in Toronto, however these were made in China. Did like all the others, auditionned most speakers at around 400$ a pair (JBL, audioengine,KRK 5, HS 50 Tannoy 4 inches, BX5 and Presonus 5) This one is the less costly, and it came out to me as a clear winner for it's balanced , clean, detailed sound without being too fatiguing on the ears. Im really impressed. no subwoofer makes it fantastic. The clarity imaging is crystal clear. the tweeters are sharp yet mellow. Not harsh or middy sounding. If they last they are the best speakers for a home studio imho. Playback is like hearing the person right there with no hiss. Very Impressive. If they last I'll never buy another pair! 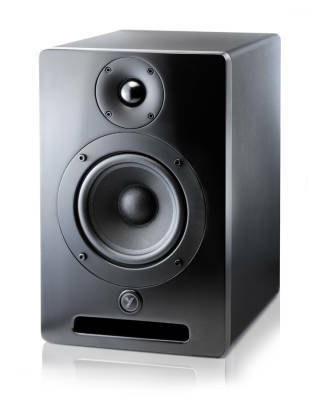 I have to say that these speakers are the best sounding studio monitors I have ever had. The price is right and they are great if your doing home recording in your bedroom like I do. Great investment. Canadian Made Matters! Plus it's good bang for your buck. tried the Krk's, yamaha's and others in the store and came home with these. Very clear true sound, well built, 2 year yorkville warranty free...can't go wrong...love em. I was down to either the Rockit5 speakers or these, and these seem to have better clarity - the Rockits seemed more mid-range. Very solid build and feel to them. I think these are a great value for the money spent. 2 year standard warranty was a nice touch too. I can't believe I bought York studio monitors, but after a ton of research and standing in the store for a while going back and forth between all the pairs on the shelf, it was very apparent they had the best full sound and the best price.. it was a no brainer. They clearly out performed every other 6" and 5" there. They only have trs inputs. They have controls on the back for level and frequency adjustment. I am very happy with these so far! These sound amazing for the price. Nice punchy sound with lots of clarity. Planned to buy the KRKs at first but these caught my eye. I don't regret buying them, and neither will you. I was very impressed with the quality of these monitors, they were clear at the full rang not colored, tight, sounds great at low volumes as well as high, very punchy for a little speaker. I highly recommend them. I really like these monitors, after listening to the krk, Yamaha and JBL its was very clear which one I wanted. I love the fact besides sounding great you can actually shut it of with a lit push button at the front, wow.